Ahead of the release of their next album, recording of which has been delayed, Within Temptation are releasing a new EP on 27th September. Entitled "Paradise (What About Us)? ", it features four tracks - the title track plus three demo versions of songs that will appear on the new album. The teaser video plus the news that former Nightwish singer Tarja Turunen is appearing on the title track has got fans excited, despite the fact that the tease video featured a section where Tarja's voice is almost inaudible. The opening section of the song with it's strings sounds uncannily like "Why not me", the opening track of the band's "The Unforgiving", but the song does then develop differently. As you'd expect Sharon's vocals are dominant for most of the song, but at one point Tarja does sing alone with that beautiful distinctive voice of hers, and later she uses her operatic style vocals. During the chorus Sharon's voice is dominant but Tarja's voice is there too adding a bit extra. 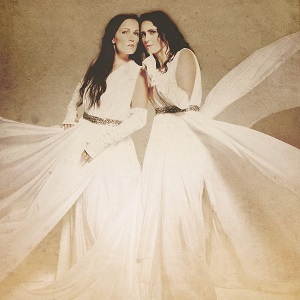 It's a great song that fans are going to love, and will appeal to both Tarja fans and Within Temptation fans. The next three songs are demo versions of song's from the forthcoming album. I have to say I really can't see the logic in this - why release half finished versions of songs in advance of the proper versions? I can understand releasing the demo versions as part of a deluxe version of the album where fans can compare them to the proper versions, but I just don't see why you'd release them like this. I can only assume they didn't have any other songs to include with the title track for the single release. The songs do all sound very good, and after listening to them I'm definitely looking forward to the album. The problem is that the EP is 4 songs that you'll have to buy again when you buy the album, and with three of the songs being unfinished versions then why would you waste your money buying the EP? Most bands release tracks on an EP that aren't included on the album to make it better value. Sadly there is another big problem that I have with this release. The EP looks like it will only be available as a download - which like many fans I am not a fan of - I'd much rather get a release on CD, so will be giving this a miss and will wait for the album instead. Being a cynical person sometimes I don't think it's a coincidence that the EP release was announced the same day that the band announced that delays in recording the album means that their European tour has been rescheduled (which has resulted in a lot of unhappy fans who had travel and acomodation booked that they can't get refunds on). A great song but a flawed release.